Camping holidays with the whole family together in large family tents are becoming more and more popular. A lot of campgrounds specialize with recreation areas for children and family camping. The kids find like-minded and can play without worry while the parents relax and enjoy life. To accommodate the adventures camping family many different large family tents are available. Large family tents offer lots space. There are sleeping cabins as well as storage area and some sort of living space. Large family tents are easy to recognize by an entrance area at standing height and often large clear windows. The interior of those tents provides enough space to sit together around a small camping table. There may also be a small cooking area with enough space for a cooking plate and a camping cabinet for kitchen equipment. On bad weather days, the family can wait out the bad weather spell playing games or read without actually being “glued” together. A large awning protects the entrance from rain and wet stuff can be dried off there. Often the interior sleeping compartments are movable so that the interior can be designed as desired. Does the family tent have a disadvantage? Depending on size and material, large family tents can be quite heavy and bulky when packed. They are not really meant to be used on hiking trips but rather to be put in your trunk and set up right at the campground. Realy large family tents, such as the Outwell Montana are super heavy and large, which makes it a pain to carry. For backpacking trips, you want to choose lightweight tents such as the Archer Outdoor Gear 1 Man Camping and Backpacking Tent. Most family tents are easy to pitch with practice. Before going camping, you should set up and take down the tent a few times, as this will make the process easier at the campgrounds. 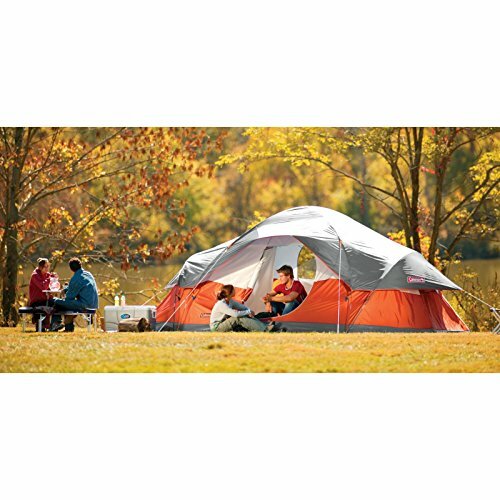 Coleman tents are very popular family camping tents. The Coleman Montana 8 Person Family Tent is spacious and comfortable providing enough space for a family of 6 to sleep in without feeling all cramped up. With eight people it may be a bit of a squeeze. The tents provide an electrical access port so you can run a power supply cord into the tent. The large covered front porch allows storage of gear out of the weather and a number of sewn in bags provides convenient storage of important stuff. The Coleman family tent is strong and stable but still easy to pitch through Coleman’s clever shock-corded poles, continuous pole sleeves as well as Coleman’s InstaClip attachments. 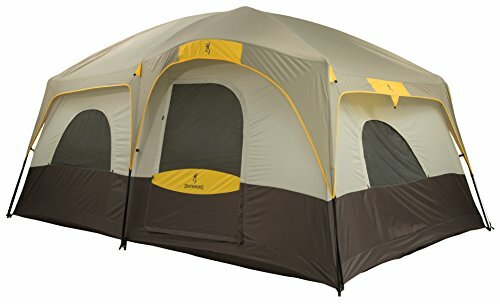 The Coleman Montana 8 Person Family Tent is one of Coleman’s best-selling tents. This is another contender of Colemans best-selling family tents. The Red Canyon Model comes with room dividers to create 3 rooms that may allow up to eight to be accommodated in this 17 by 10 feet large family tent. It’s strong dome construction holds up well in strong winds and Coleman’s exclusive Weathertec System will keep the rain outside and keeps you dry and cozy if the weather turns ugly. The affordable price of the Coleman 8-Person Red Canyon Tent makes this a great value camping tent. Made by Alps Mountaineering, the Browning Camping Big Horn Tent is an extremely large family tent for camping with the entire family. Big enough to fit even a queen sized camping bed and three twin-sized cots on either side, it still has enough space to walk around the room and stand upright. Two wall dividers create separate rooms. The Browning Camping Big Horn tents three-pole design allows pitch the tent up swiftly. 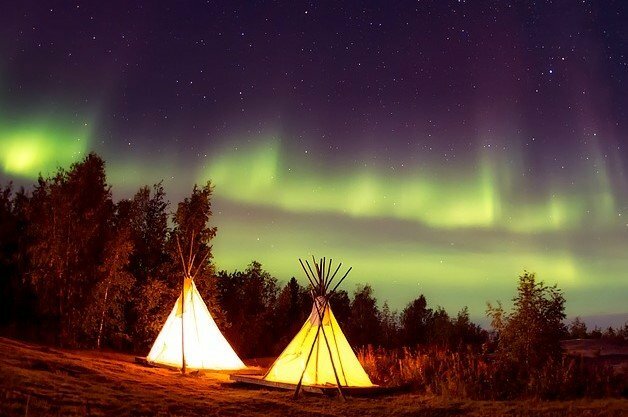 The tent is strong and stands firm in wind and weather providing protection from the elements. Wenzel is a reputable tent manufacturers with over 120 years of tent making history. Their quality tents are lightweight and durable. The Wenzel 8 Person Klondike Tent is a popular family camping tent. It lets you stand up straight in its 6.5 high large spacious interiors which is separated into two rooms with its zip up walls. A large covered sheltered porch may be used as sitting room or storing camping stuff or drying gear in. Made of Weather Armor polyester fabric with a polyurethane coating, this high-quality material protects from rough weather conditions. 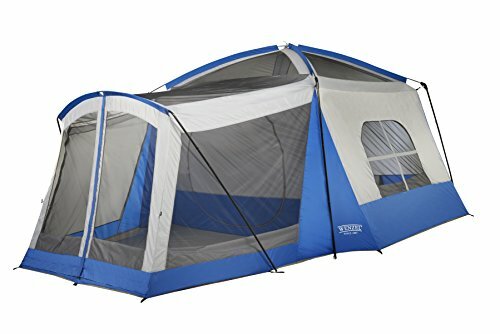 The Wenzel 8 Person Klondike Tent is a great quality tent for camping with the whole family or friends. 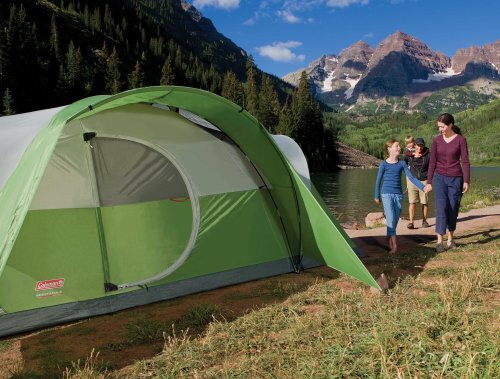 This Coleman 6-Person Instant Cabin Tent is a very popular family tent. It is really quick and easy to set up thanks to the pre-attached poles pole system which just need to be pulled out and secured. Setting up takes only a couple of minutes, but the tent is still stable in wind and weather. The strong durable fabric coated with polyester protects from heavy rain.The Coleman6-Person Instant Cabin’s interior is spacious with plenty of room for the family and camping gear. Dome tents are designed to be suitable for active families who need a lightweight tent for hiking in the open countryside. The self-supporting construction of a dome tent can withstand strong winds and rough weather. If the ground is too stony or too sandy for the tent pegs to provide support dome tents have enough self-support to stay in shape even without guy ropes. Tunnel tents are easy to set up with only a few parallel poles. However, this design of large family tents necessarily needs pegs and guy ropes to stand. They are less resistant to strong wind in than a dome tent or a geodetic tent construction. The advantage of the tunnel tents is the weight – space ratio and the favorable use of the interior area due to the steep walls. They are spacious and often provide headroom at standing height. The latest tent design invention is the Pop-up Tent. Simply unpack the tent, throw it onto the ground and the tent unfolds completely by itself. Pop up tents are designed with built-in very flexible hoops that have the tent springs into shape immediately when unpacked. They are not that strong to withstand extreme weather but rather are for recreational use and not for use in remote areas. The side walls must be supported by guy ropes to ensure stability. This sounds incredible but actually works. 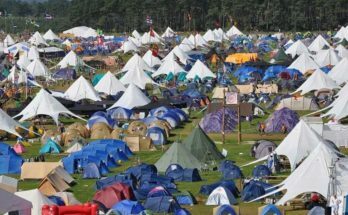 Features of large family tents to consider when buying a tent. Design – dome, tunnel or pop up tent. How quick and easy the tent can be set up. The fewer poles the easier and faster the tent is set up. Entrance – How many doors does the tent have? What is the shape of the doors and how easily do they open and close? 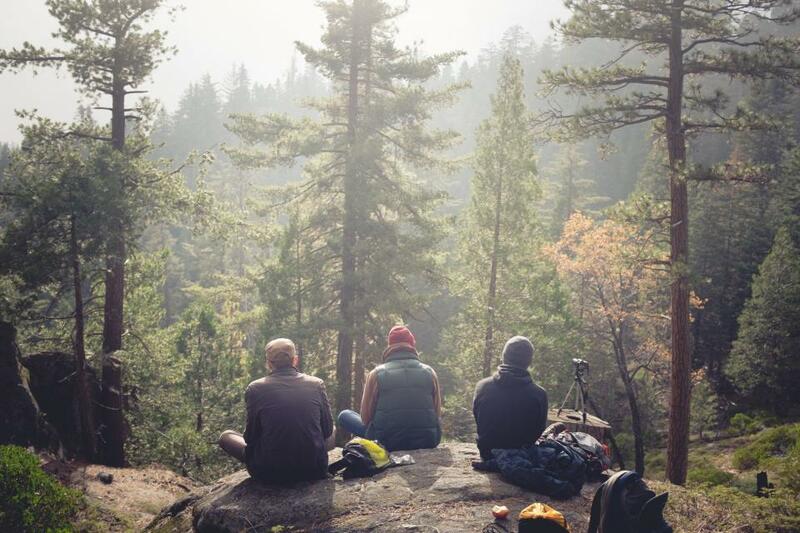 Pack Size – What are the weight and the dimension of the tent when it is packed up. This specification is particularly important for campers or hikers. Headroom – Take care of a sufficient headroom. Floor Space: When looking at floor space, check the dimensions, not just the square footage. Tall people need a longer layout. Water column – The higher the water column rating, the longer the tent inside stays dry even in heavy rain. Ventilation – Mosquito screens are often found as inner doors, windows and ceilings. This improved ventilation reduces moisture buildup. They also keep annoying insects away. Front porch – provide enough space to sit in and keep luggage or dirty shoes dry in bad weather. Awning – an additional watertight tarpaulin which extends over the entrance area to increase the usable area. Interior and bags – A loop is often provided on the ceiling for the lantern. Sewn-in pockets are useful to store small parts such as car keys and flashlight and stuff you want to find quick. Today’s tents are made of different high tech “plastics”. 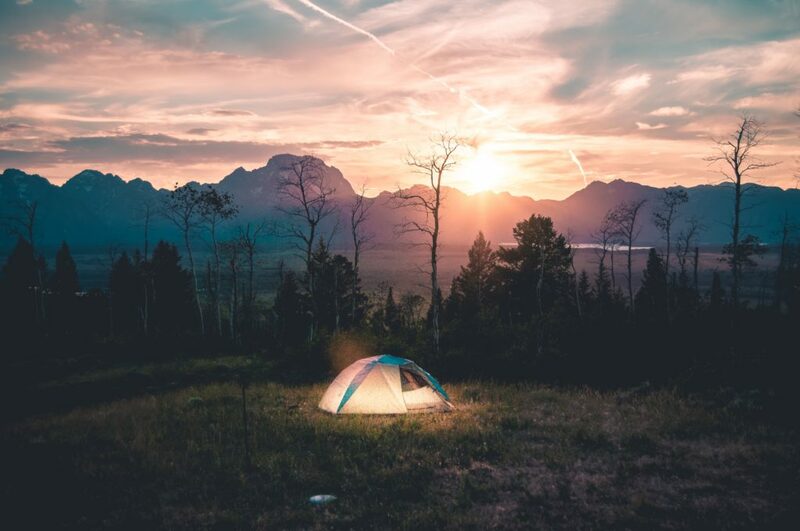 Whether it is for the family camping holiday or an expedition tent for extreme environments you need, there is always a suitable tent to find. Materials used for inner and outer tent wall depends on where the tent is to be used. The question for the best tent material cannot be answered in general. The tent poles are made of materials such as fiberglass, aluminum, aluminum alloys, steel, carbon or Featherlite. Usually, different materials are used for the external, internal tent and tent floor. 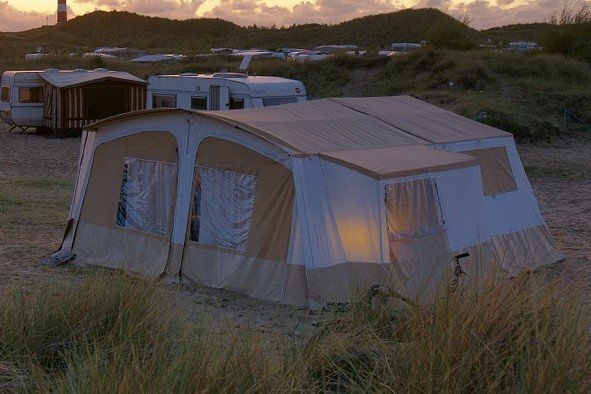 This is due to the fact that each part of the tent is exposed to different load. For example, the tent floor needs to be of a more heavy and durable material than the outer wall of the tent. Cotton: Cotton as outer skin is very breathable and waterproof. Especially in hot and humid conditions this creates a more comfortable climate inside the tent over modern plastics. Impregnation is optional, but not necessary. When cotton becomes wet, the fabric expands and it becomes impermeable to water. Although the material is very durable and UV-resistant, it can still rot. The weight and the drying time are clearly a disadvantage. Nylon (polyamide): Used for the tent floor because it has a very high tear and abrasion resistance as well as elasticity. Moreover, the material is very light compared to polyester. The UV resistance also leaves much to be desired. RipStop nylon: a light-weight nylon fabric where tear strength is increased with interwoven threats. Even cracks are no longer unbraked through the entire fabric but only go only to the next stronger thread. The material is used uncoated as an internal and coated as an outer tent. Polyester: High tear and abrasion resistance. Durable and a relatively high UV resistance. The material does not expand when it is damp. A drawback is the higher weight when compared to nylon. PVC – inexpensive, heavy, rigid in cold weather, low resistance to UV and aging, not environmentally friendly. Acrylic – inexpensive, weakens the tent fabric, breaks in extreme cold. Polyurethan – most common tent coating. Good sealing, soft and supple even in cold weather, UV-resistant. Sufficient for most uses, but not as long-lasting as silicone. Silicon – most expensive tent coating but the best. Durable, elastic, UV resistant, high and low temperature resistant, long lasting. Next Article Who makes the best tents for camping?